♦ RATES: Our discounted rates shown above are in Thai baht and are for 1 golfer. They are applicable until 31st Oct 2019 but are subject to change without notice. ♦ CARTS: Carts are compulsory at Red Mountain. One golfer to a cart. Pay for carts direct to the golf club pro shop! ♦ CADDY FEES: Caddies are compulsory at all of Phukets golf courses. Your caddy fee of 400 baht is included in your 'golf package'. If you have purchased a 'green fee only' you will need to pay the caddy fee direct to the pro shop. ♦ CADDY TIPS: These gratuities are NOT included in your golf package! Red Mountain golf club recommends a caddy tip from 300 baht payable direct to the caddy after the game. ♦ NON-GOLFERS: Non-golfers accompanying golfers must pay a 'Non-golfer fee' of 1100 baht direct to the golf club. This includes a cart and caddy for the non-golfer. Non golfers are expected to dress appropriate to the golf course (correct golf attire). 300 THB 100 THB 100 THB Carts are compulsory and payable at pro shop at 700 THB per person. 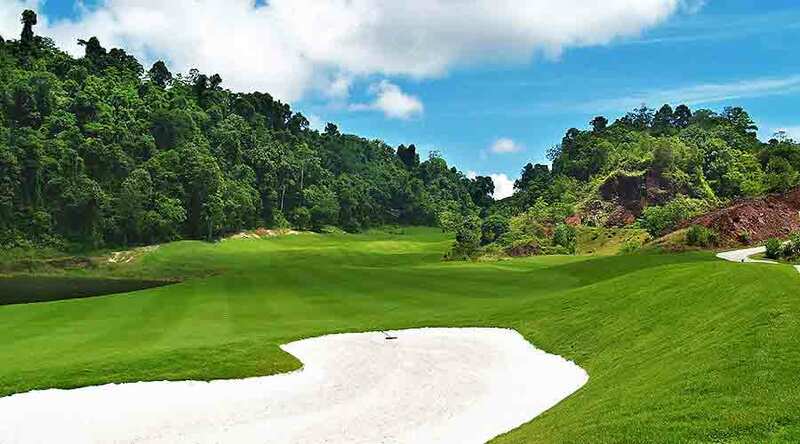 Red Mountain Golf Club, Phuket, has been open for over 7 years, and is generally recognized by golfers as the best course in Phuket and one of the best in Thailand. The course was constructed amidst a former tin-mine in Kathu, to the backdrop of the red mountains from which the course takes its name. This championship-level course is set over approximately 7,000 yards from the back-tees and enjoys a par of 72. 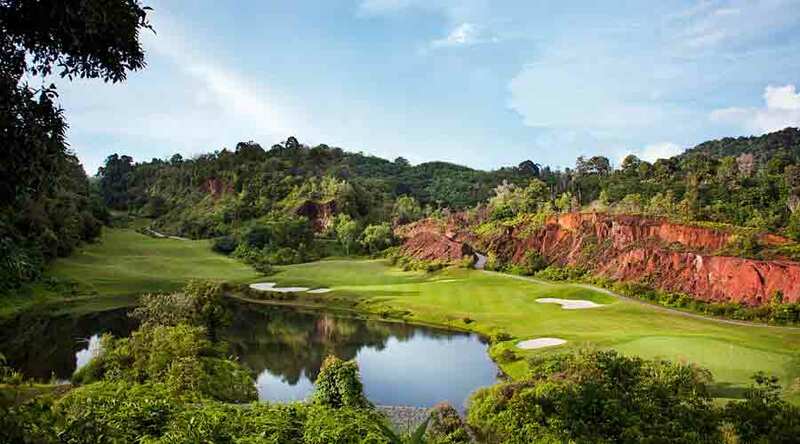 Setting high international standards in Phuket for golf, Red Mountain weaves its way through the mountainous terrain, set amidst lots of natural beauty and enjoying luscious jungle vistas. The course is a real golf challenge, but is a must-try experience for golfers of all abilities. The course is a mixed bag of delights with many long par-4s, counter-balanced by some drivable par-4s and world-class par-3s, such as the dramatic elevated vistas and 50m drop from tee to green on the signature 17th hole. 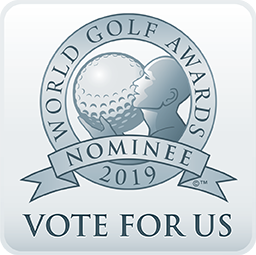 Meandering its way through natural waste bunkers, tropical rainforests, mountainous backdrops, deep ravines and flooded gullies, the courses’ majestic path through dramatic changes in elevation create a picturesque experience unmatched on the island. With shade-tolerant Bermuda Hybrid grasses and glass-like putting surfaces that are fast but true, this is a course for the serious golfer. The course conditions are what you would expect from one of the best championship courses in Thailand. The world-class onsite facilities at Red Mountain include a large 5-star clubhouse with luxurious changing rooms and a pro-shop. ♦ Newest Championship Course in Phuket. ♦ Unique golf experience weaving its way through a former tin-mine. ♦ You simply must play the jaw-dropping 17th hole with its 50-meter drop. ♦ 5-star clubhouse and facilities. ♦ Absorb the stunning red mountainous terrain at first hand. ♦ Central location in the heart of Phuket at Kathu. 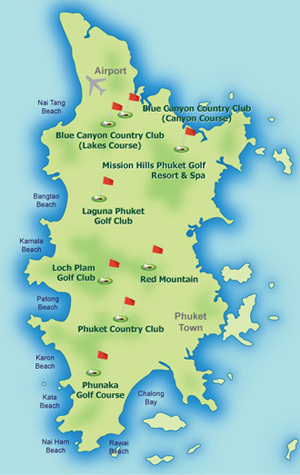 ♦ Generally regarded by golfers as the best course in Phuket. ♦ Shade-tolerant Bermuda Hybrid grasses. ♦ Fast but true putting surfaces. The spectacular par-3 17th hole at Red Mountain really epitomizes the nature of this 5-star Phuket golf course. This par-3 is set over 169 yards with an elevated tee-off with a 50-meter drop from tee to green. Standing on the tee is daunting, as there is a narrow corridor through the luscious jungle terrain to the green, but don’t be afraid, just enjoy the experience. 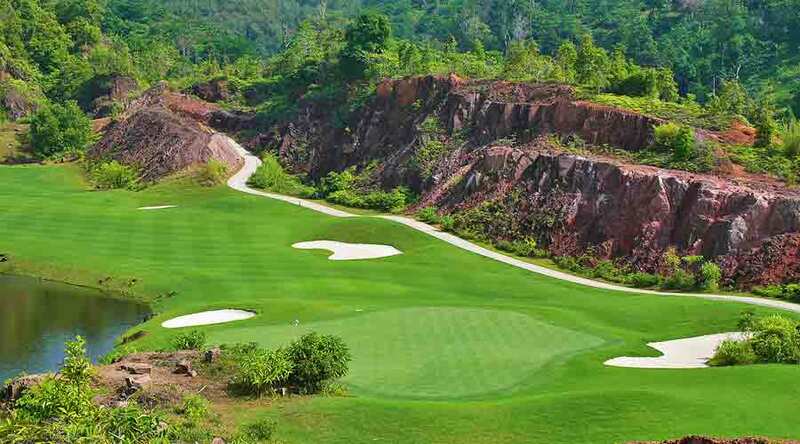 When you are looking to play one of the best and most challenging courses in Phuket, the Red Mountain GC in Kathu is a complete experience in terms of layout, conditions and onsite facilities.